War and Remembrance: The Story of the American Battle Monuments Commission. Thomas H. Conner. Lexington, KY: University Press of Kentucky, 2018. Those who have walked the grounds of an overseas American war cemetery are unlikely to forget the experience. The endless rows of white marble headstones, meticulously cared for lawns, and works of art and architecture organized around the Christian theme of redemption distinguish these sites as particularly American. No other nation has created such a variety of works of high design. In fact, the grave marker in the shape of the Latin cross has become an icon for American war sacrifice. The overseas American war cemeteries were the work of the smallest agency of the executive branch, the American Battle Monuments Commission—one of the least understood agencies in the federal government, which is saying a lot. The history of the American Battle Monuments Commission is a fascinating account of logistical genius, cultural diplomacy, remembrance priorities, and memory wars. But it is also a history of insistent whitewashing of American identity and religion by an exclusive midcentury good-old-boys club of commissioners, veteran employees, artists, and architects. And, until recently, it was the history of a failed mission to educate and promote awareness about the overseas American war cemeteries. The latter is a murky and problematic history, and it would take a brave historian to untangle the issues outlined above. For both sets of histories, however, Thomas H. Conner’s War and Remembrance: The Story of the American Battle Monuments Commission is a good place to start, offering a wealth of names, dates, and statistics, as well as some analysis of important figures’ influence on commemoration, particularly that of John J. Pershing. Conner’s book is remarkable for several reasons, not least because he clearly explains the influential role of Pershing in the planning of the overseas American war cemeteries. Indeed, Conner asserts that “…between the armistice and his death in 1948, John J. Pershing was unofficially, but undeniably, the ‘chief of national remembrance.’” For example, in 1919, before the American Battle Monuments Commission was formed, Pershing suggested specific sites for the American monuments—works of commemoration separate from the eight already existing war cemeteries. This is a crucial fact to note, as people often wonder why American World War I monuments exist outside of the cemeteries. Pershing also suggested maps be prepared to help educate visitors about the work and successes of the American combat divisions as opposed to other divisions like supply. Battle maps did not enter into the design scheme of World War I cemeteries—excepting Saint Mihiel American Cemetery—but they played an important design role in the World War II cemeteries, pointing to Pershing’s lasting influence. Conner attributes the hierarchical scale of the monuments relative to their battle importance to Pershing’s belief in “the principle of relative values,” but his text does not link this history of Pershing to Elizabeth Grossman’s important article on the topic, not even in a footnote. Yet Conner’s account of Pershing’s influence is no less than fascinating. He relates how Pershing wanted to regulate the construction of private memorials, preferring to honor all American soldiers rather than highlight any one division over another. Conner’s narrative of Pershing’s role in various designs elements is absorbing and reveals the general’s fastidious attention to detail, particularly in the way Pershing butted heads with architect Ralph Adams Cram in the siting and placement of the chapel in the Aisne Marne American Cemetery. Conner clearly makes the point that “artistic issues…had to be managed,” and that Pershing was usually the problem solver. For example, in the Saint Mihiel American Cemetery, Pershing ran up against yet another difficult artistic issue to resolve, but this time it was trickier than brokering a deal with a testy architect. A private memorial had been placed inside the Saint Mihiel American Cemetery to honor Walker Blaine Beale, a soldier buried there. Beale was the grandson of the important American political figure James G. Blaine. Attempting to control the quality of American material culture and hold it to the highest standards, Pershing had enforced a rigid policy of banning private memorials. His decision to allow the Beale memorial to be placed inside the cemetery was a major exception, demonstrating considerable bias toward the social elite. Conner concludes Pershing “did not want it found out that they had operated on a double standard in the case of the Beale statue.” It is a revealing episode, and Conner’s analysis would have benefitted from contextualizing it with another study of private memorials by Sam Edwards, whose rich analysis only would have complemented Conner’s. In his examination of the art and architecture, none of Conner’s wonderfully in-depth descriptions are referenced with a call-out to any of the book’s interesting figures, which is an unfortunate oversight, particularly since undergraduates especially need illustrations to help break up long accounts like those he offers. By 1925, the French government had approved all sites for the American Battle Monuments Commission to construct permanent monuments and cemeteries. Of interest to architectural historians is Conner’s account of how Charles Moore, chairman of the Commission of Fine Arts, introduced the beautifying program that was the main goal of the American Battle Monuments Commission. The Graves Registration Services of the Army quartermaster had constructed temporary American war cemeteries, but compared to the elegant designs of the Commonwealth War Graves Commission—by which the Americans consistently measured their cemetery schemes—they were rather utilitarian. From his meticulous research of the archives, Conner assembles a statistical report of what the government anticipated spending in 1925, including $1 million for all eight cemetery chapel structures as part of the commission’s beautifying effort. Later, he accounts for what was actually spent: $2,360,000 spent on the eight World War I cemeteries and $2,050,000 on eleven monuments and two commemorative tablets. Conner glosses over exactly how the American Battle Monuments Commission selected fifteen different American architects for the major commissions involved in designing the cemeteries and monuments, however—and here he misses the opportunity to point out how closed the selection criteria were: white, male, veterans of World War I, and of a certain social standing. Even in the early mid-century, important architecture commissions often were open competitions, allowing anyone of any gender or race to enter; at the very least, the were advertised outside of a select group of architects. His weak method in social history is at its worst in the examination of the iconic headstone of the overseas American cemetery, when he outlines the April 1924 presentation to Congress regarding the design of the headstone. David A. Reed, the Senator of Pennsylvania and an American Battle Monuments Commission commissioner, presented the argument to ensure the headstone would be that of the Latin cross. In May 1924, the Johnson-Reed Immigration Act set quotas on immigrants from Asia and limited immigrants from other countries; Reed co-sponsored it. Nowhere does Conner make the connection between white nationalism, the Latin cross headstone, and Reed. The almost exclusive use of this symbol as the shape of the gravestones effectively erased all religion outside of Christianity, thereby misidentifying the cultural roots of many Americans, including many of the 12,000 Native Americans who fought. The erasure was uniquely American. By contrast, for example, the 2.5 million Muslims who fought for France, the Commonwealth, and Russia are buried in war cemeteries with special headstones. Additionally, Conner makes no mention that during the short time families were allowed to choose inscriptions for the headstones, they had to pay for it themselves. The private responsibility of payment makes all the difference for understanding why American headstones do not bear personalized inscriptions like those of the Commonwealth, which granted next of kin the right to choose inscriptions composed of sixty letters at no cost. In a different section, while explaining the American Battle Monuments Commission preference for useful memorials, Conner fails to link it to the wider 1920s movement of the so-called living memorials of civic buildings such as tunnels, auditoriums, and stadiums. One of countless examples across the United States is the Worcester Memorial Auditorium. The topic of living memorials is a rich and important cultural reflection of the values of this era, as research by Andrew M. Shanken demonstrates. Regarding the important Gold Star Mothers pilgrimages, Conner writes how they “coincided with the peak period of construction of the American Battle Monuments Commission monuments and chapels, and with the final stages of beautification of the cemeteries.” It seems important to consider how the anticipated audience of these women might have influenced the design decisions. Women are generally an afterthought in Conner’s book, even though some, like Eleanor Butler Roosevelt, who was married to Theodore Roosevelt Jr., had a critical role in post-World War II war cemeteries. Conner, perhaps following the archive too closely, refers to her by her married name, Mrs. Theodore Roosevelt, Jr. This is a dated method, with roots in the Victorian era, that works only to erase women from history. He also incorrectly refers to the lead consulting architect, Paul Philippe Cret, with the title of Dr., though Cret never earned a Ph.D. Other Cret oversights include no mention of his service with the French during World War I, nor any mention of Cret’s involvement with private monuments. Cret designed a living memorial fountain to Quentin Roosevelt in Chamery in 1919, and another to soldiers from Pennsylvania in Varennes-en-Argonne in 1927. The fact that he designed both likely influenced the decision of the American Battle Monuments Commission to turn a blind eye toward them when asserting the prohibition on private memorials. Despite these oversights, Conner narrates fascinating episodes when analyzing the World War I cemeteries, including the reason the cemeteries were closed after they were dedicated. When it became clear that reburial was necessary to realign graves in Somme American Cemetery and the Oise-Aisne American Cemetery, veterans of the 27th Division attempted to block exhumation of their comrades. Eventually, the graves were realigned, but Pershing and other American Battle Monuments Commission commissioners “decided once and for all that ‘no removal of any body from any of these cemeteries should be permitted under any conditions whatever.’” Conner offers more insight about the designs from World War I than he does about World War II, but he traces the commission right up through the 2000s, when it created its first visitor interpretation centers. Chapter 5, on how the cemeteries, monuments, and American Battle Monuments Commission staff fared during World War II, is especially dramatic. 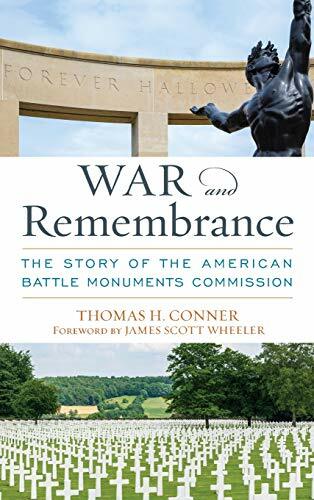 Conner’s book offers an unparalleled account of the American Battle Monuments Commission. He identifies heretofore nameless staffers of the agency and offers a more informed sketch of its commissioners. This is an incredible contribution to the history of the American Battle Monuments Commission, as no finding aid or guidebook of names to its records exists. However, the reverential and uncritical tone with which Conner treats the American Battle Monuments Commission is at times tiresome, and he offers sparse analysis beyond what the archive demonstrates—even when it reveals obvious prejudice. Despite large gaps in secondary source analysis, Conner’s research helps readers understand the deep influence the American Battle Monuments Commission, and Pershing in particular, had in forming an American approach to war commemoration in Europe. Kate Clarke Lemay is a historian at the Smithsonian’s National Portrait Gallery. She is the author of Triumph of the Dead: American World War II Cemeteries, Monuments and Diplomacy in France. Conner, Thomas H. War and Remembrance: The Story of the American Battle Monuments Commission. (Lexington, KY: University Press of Kentucky, 2018), 50. The American Battle Monuments Commission was formed in 1923. For analysis of visualizing American militarism through battle maps, see Kate C. Lemay, “No Vain Glory: Militarism, Diplomacy and Art in the American War Cemeteries in France,” The Journal of War and Culture Studies. 8: 2 (May, 2015), 175-196. Conner, War and Remembrance 89. Sam Edwards describes the long history of American efforts to construct private memorials in Normandy and in East Anglia, England. See Edwards, Sam. Allies in Memory: World War II and the Politics of American Commemoration in Europe, c. 1941–2001 (Cambridge: Cambridge University Press, 2015), 82–128. Conner, War and Remembrance, 66; 139. There are about seventeen American headstones from WWI that do have an inscription engraved on the back. However, they reveal a highbrow education and privilege (quoting Shakespeare or poets very popular in a particular social strata of Victorian and turn of the century Americans) or they distinguish a hierarchy in death by asserting the soldier was Killed in Action (rather than dying a less dignified death from disease like influenza.) For a discussion of the iconic design of the American headstone, see Kate Clarke Lemay, Triumph of the Dead: American WWII Cemeteries, Monuments and Diplomacy in France. (Tuscaloosa, AL: The University of Alabama Press, 2018), 77-86. For the discussion of the option to engrave sixty letters in inscriptions, see pages 83-84. Conner, War and Remembrance, 72-74. Eleanor Butler Roosevelt served as a Commissioner on the American Battle Monuments Commission from 1953 until her death in 1960. She was appointed by President Dwight D. Eisenhower. Conner, War and Remebrance, 218. I am unaware of Paul Cret ever being awarded an honorific title. Conner, War and Remembrance, 100. Newer PostThe United Nations in Mali: A New Approach to Peacekeeping?